Here are some of the latest photos from our new build project at MKCC. Looking down from the exit which will lead towards Kidz Church. This will be a seating area for our coffee shop along with access to small conference rooms. They are being punched through into our existing building on the left. In the distance you can see the doors leading into the Auditorium. Close up of 2 of the doors being knocked through into the conference rooms. Lighting detail which goes round the perimeter or the auditorium and will throw a ribbon of light against the walls. A little shaky I know. But its not the auditorium moving its my bad camera work. 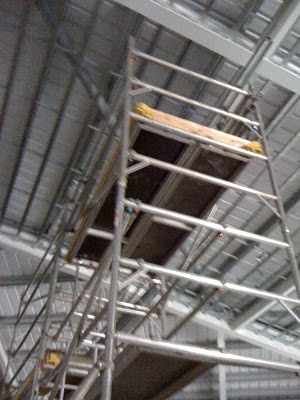 Preparing the roof for the finished plasterboard to be added to the underside.